Technological advances are changing the way renal tumors are diagnosed and treated. Many are now discovered incidentally with increasing use of diagnostic imaging modalities such as ultrasound, computed tomography, and magnetic resonance imaging (1,2). At the same time, advances in laparoscopy and minimally invasive surgery are changing the way renal tumors are treated, with reduced morbidity and more rapid recovery, while striving to maintain oncologic efficacy. 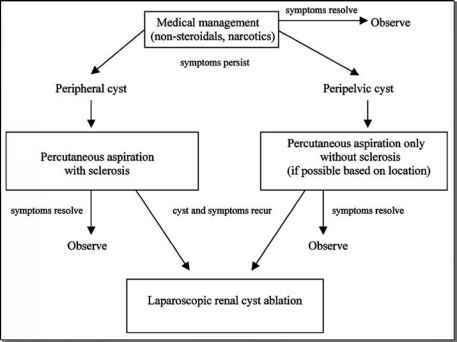 First performed in 1990 by Clayman et al., laparoscopic nephrectomy demonstrated the feasibility of minimally invasive renal surgery (3). Subsequently, laparoscopic radical nephrectomy for renal tumors was demonstrated to be technically feasible and oncologically effective (4,5). Concurrently, nephron-sparing surgery, in the form of open or laparoscopic partial nephrectomy, has been shown to be a safe therapeutic alternative for the treatment of small renal tumors (<4 cm) (6-9). Ablative treatments for renal cell carcinoma are currently being developed further reducing the morbidity associated with nephron-sparing surgery. These treatments also present a reduced technical challenge when compared to more conventional partial nephrectomy. Cryoablation (10-12) and radiofrequency ablation (13-15) currently comprise the ablative modalities that are in clinical use, although promising modalities such as high-intensity-focused ultrasound (16,17) and stereotactic radiosurgery (18) are under development. The purpose of this chapter is to discuss radiofrequency ablation treatment and results.